Our classic blue match report this weeks comes from the Guardian and the 2007 League Cup quarter-final win over West Ham. Everton produced a brilliant performance that left all Evertonians dreaming of Wembley. Everton had already beaten Sheffield Wednesday and Luton on the way to the quarter-final and after Yakubu scored a late winner against West Ham the Blues headed into a semi final against Chelsea full of hope. Unfortunately, Mourinho’s Chelsea has too much for Everton over two legs with a Joe Cole goal at Goodison ending Everton’s hopes. Whisper it – Everton may be heading for a cup final. The Merseysiders had already entered uncharted territory under David Moyes with their appearance in this Carling Cup quarter-final. It was a first under him in five years of frustration in knockout football. Yet the manager could give vent to joyful celebration as Yakubu Ayegbeni, the club’s record signing, repaid another portion of his £11.25m fee with the late winner which punished a shocking West Ham United defensive lapse. With Manchester United already out and Chelsea facing Liverpool in one of the other three quarter-finals next week, Moyes might allow himself to dream of a favourable draw and a trip to Wembley. The Scot, though, is made of more pragmatic stuff. The Premier League remains his priority and he simply allowed himself to savour this victory in isolation. And to lavish praise on Yakubu, for whom this was a sixth goal in four matches and 10th overall for the club. If Yakubu was the match-winner, then West Ham will not wish to dwell on how they contributed to their downfall. A tense occasion appeared to be drifting towards extra-time when Phil Jagielka propelled a high ball forward and confusion descended on West Ham’s central defence. Danny Gabbidon and Matthew Upson hesitated, Gabbidon then hoped that Robert Green, the goalkeeper, would come but when he did, belatedly, Gabbidon had already made up his mind to head the ball back. All the while, Yakubu had given chase with a growing scent for the opportunity. Gabbidon’s header thudded into Green at point-blank range, the ball wriggled loose and Yakubu kept his cool to the delight of the travelling hordes. Alan Curbishley is synonymous with even temper. He celebrates his paper anniversary as West Ham manager today – one year of wildly fluctuating emotions – and he simply craves a “nice, solid season”. But he struggled to conceal his frustration and rounded on first the referee Mark Halsey, for not giving a foul on Dean Ashton before Jagielka’s long punt, and then Everton’s “professional” tactics. Curbishley’s gripes did him no credit. Everton recovered from conceding an early goal to Carlton Cole, after a defensive freeze of their own, to take control of the first half. With Lee Carsley never too far in front of his back four, the dangerous Tim Cahill deployed just off Yakubu and Mikel Arteta, as ever, so easy on the eye, Everton had rhythm and possibilities. The equaliser was a beauty. They worked the space on the right flank before Carsley spread the play wide left to Steven Pienaar. He dropped his shoulder, then checked and appeared to have halted the move’s momentum. But his pass inside invited Leon Osman to strike first time and his left-foot shot deceived Green. The desire of both sides to progress was reflected in the teamsheets: no rotation, the strongest available line-ups. Ashton was brought back by Curbishley for his first start since early October but he looked rusty and it was Cole who quickened the pulses. When Joseph Yobo allowed Lucas Neill’s long ball to drift in behind him, Cole capitalised for his fourth of the season. 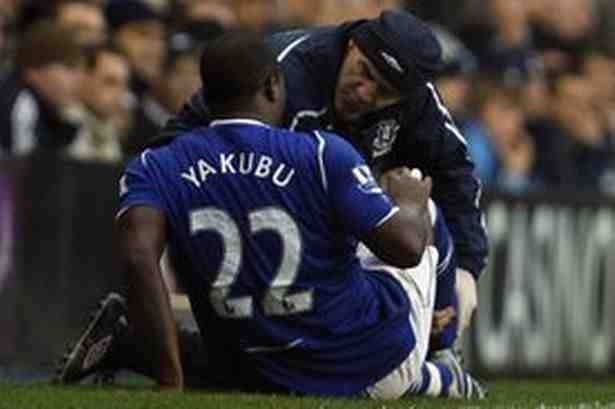 The second half brought plummeting temperatures and stalemate but Yakubu’s opportunism warmed Moyes. Everton’s last silverware was the 1995 FA Cup. Might the wait be approaching its end?